As the calendar year winds down, many companies are entering their annual renewal dance with Microsoft, working to get budgets set for 2019. But more and more companies are struggling with the clock winding down, with Microsoft negotiations getting delayed multiple times. And this year, that is critical because new Premier / Unified Support price increases can get dropped on the table like lead balloons with little or no time to react. DON’T WAIT. In the past, clients have used the common negotiating tactic to delay, delay, delay to make Microsoft reps sweat. Not only isn’t that working any more, Microsoft, and particularly the Premier / Unified Support organization, are more commonly the ones dragging their feet this year. 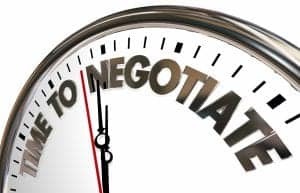 Negotiating for better pricing and discounts – or even pushing to adjust contract dates – needs to happen as early as possible to allow for enough time to counter price hikes with your due diligence. Uncouple Support from your EA agreement. In the past, companies could gain concessions on support pricing as part of co-terminus EA agreements. With Unified Support, pricing is now formulaic and offers reps much less wiggle room vs. what was Premier. There is no advantage to mixing the two conversations, so isolate them and negotiate independently. Gather granular utilization detail. For both application and support hours, it is critical to document actual levels of utilization, on a line item basis. Quantifying the gaps between promised benefits from last year’s renewal negotiation and actual consumption is a powerful lever in conversations with your Microsoft rep or re-seller. Gauge if “all-you-can-eat” support actually has value for you. Unified Support is now a catch-all agreement that bundles support across the portfolio into “unlimited” reactive support. Reactive issues happen when they happen, and most IT organizations know how many support hours they will need annually. Paying more for “unlimited” support you don’t use is not a good deal. Not to mention, with everyone now bellying up to the buffet, quality of support is starting to suffer according to early adopters. Probe on Proactive Support changes. Proactive support in Unified is now DIY with tools and resources being made available on line — BUT its now up to you to implement them. At a minimum, don’t allow this aspect of Unified Support to be presented as an unqualified benefit. Regardless of tools and spreadsheets now being un-gated, unless your staff has the expertise and time to use them on their own it should be viewed as a neutral or negative, not a positive. Level A customer? Consider an EA renewal. Many small businesses are considered Level A customers in Microsoft speak. Determine if an early EA renewal would be acceptable now, since your leverage will evaporate by the end of 2018. With EA expenditures now driving the formula that prices Unified Support, it is critical to pay attention to downstream implications and take that into account as well. Consider other providers if you have a hybrid environment. Analyze the need to renew Microsoft Software Assurance (SA) when running primarily software on-premises, leveraging dual-use rights available through Microsoft 365 and alternative solutions from other providers. Look outside Microsoft for opinions on pricing and services. There are a variety of ways to license/subscribe to Microsoft’s offerings and get support. Your re-seller, or even Microsoft account manager, may not be well-versed in them all. Bring in unbiased expertise to assist your sourcing team with vetting the recommendations and helping structure EA’s, SA’s, and Support agreements that drive lower spend and higher utilization. US Cloud can help you prepare for your EA, SA, and Premier Support renewal conversations as well as provide you alternatives to Microsoft’s ever-increasing price tag for its services. Make sure you have world-class support the moment you need it, saving 30 percent and enjoying a 5x faster response time than Microsoft Unified Support with US Cloud’s Microsoft Support Alternative. Get a comprehensive view into the health and status of your Microsoft software and services stack with US Cloud enterprise monitoring. Streamline and standardize your backup processes throughout your business to cut your operational costs and SLAs for recovery time and recovery point objectives with US Cloud enterprise cloud backup. Automate the patching process across all your cloud and legacy infrastructure to keep your business safe and minimize business disruption with US Cloud enterprise patch management. US Cloud is here to help you simplify your infrastructure, unburden your IT team, and protect your company’s brand. With 2 billion logins managed since 1999, contact us and get a free quote today to learn how you can join the ranks of customers worldwide raving about US Cloud’s 24/7 all-American support and expertise to maximize your Microsoft investment.